Michael Aronson won the 10 magazine contest with his hit video. Michael 마익흘 Aronson is the latest You Tube sensation with over 2,458,660 hits on his music videos. 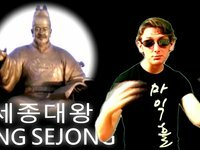 Some of his videos are parody's based on famous songs such as Hanson's "MMMBop" and creating some of his own unique raps incorporating famous places and activities in Korea. The Korean subway song above is one of my personal favorites! Days before I left Korea, they had changed the subway song on Line 1 in Jongno. So watching this video brings back good memories of riding the Seoul subway system. I'm sure many Koreans and expats alike will appreciate this video to keep the old subway song alive. The Korea Joongang Daily says that Aronson created the videos to submit in a contest for promoting Korea through 10 magazine. Aronson won first place out of 42 entries submitted to the contest and his You Tube videos have spread across Korea and are a favorite among the expat community in Korea. The well known subway tune in Aronson's hit video The Korean Subway Song has sadly been replaced. Seoul Sounds has a clip of the New ‘fanfare’ announcement that is currently being used on all Seoul Metro subway lines (Lines 1,2,3,4). Another one of Aronson's hits is in the clip below. His parody on Hanson's "MMBop" will make you die of laughter if you are familiar with the Korean treat Kimbap. In Korean, bap means rice and so there are many dishes that end in "bap" which is perfect for Michael Aronson's song. If you have left Korea already like myself, his songs are a great way to stay in tough with your Korean side! Just found this post. You should've contacted me! But thanks, it's great! Although they didn't change the transfer song in the trains, it's still the same. The fanfare you link to is to announce the arrival of a train at a station. They were still using this song as of fall of 2015, which was the last time I was on this wonderful subway system. Best in the world!